or you can buy them. I buy them from ebay and they are posted to me in clever polystyrene boxes. When you have your eggs, you either have to begin growing it at once, or keep it somewhere cool (like a garage) and turn it once a day. Fresh eggs have much the best chance of survival. However, I did once want to fill a half-empty incubator and used an egg that had been in the fridge for two weeks. 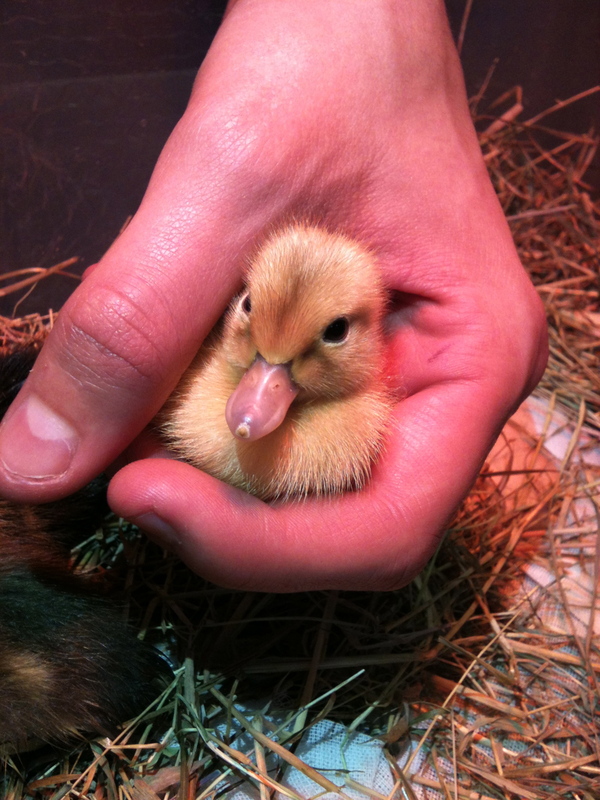 It hatched into a perfectly healthy duckling which we named ‘Cupcake’. In the wild, the mother bird will lay one egg per day in the nest and leave them until she has enough to sit on. Ducks will sit on about twenty. So, should you find a nest in the wild with cold eggs in, do not assume they have been abandoned, it could be that the hen has not yet finished laying. 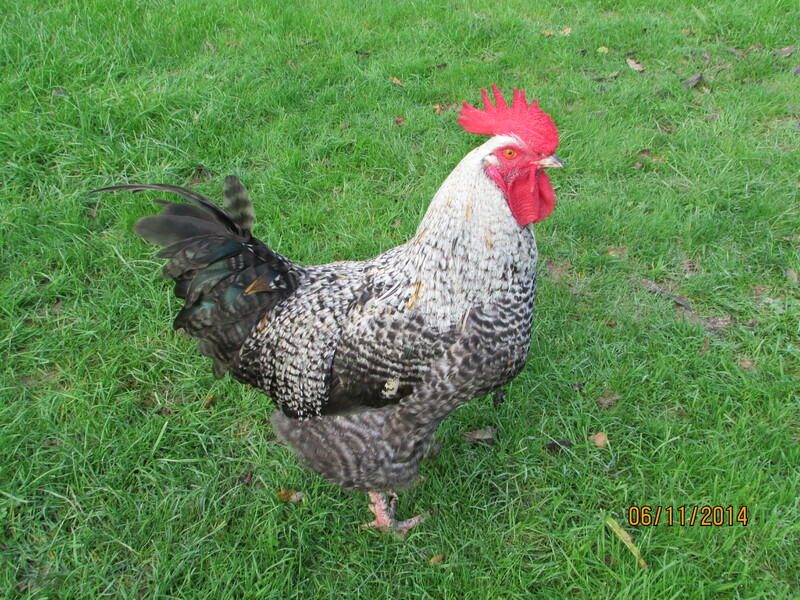 Or a female who is broody. 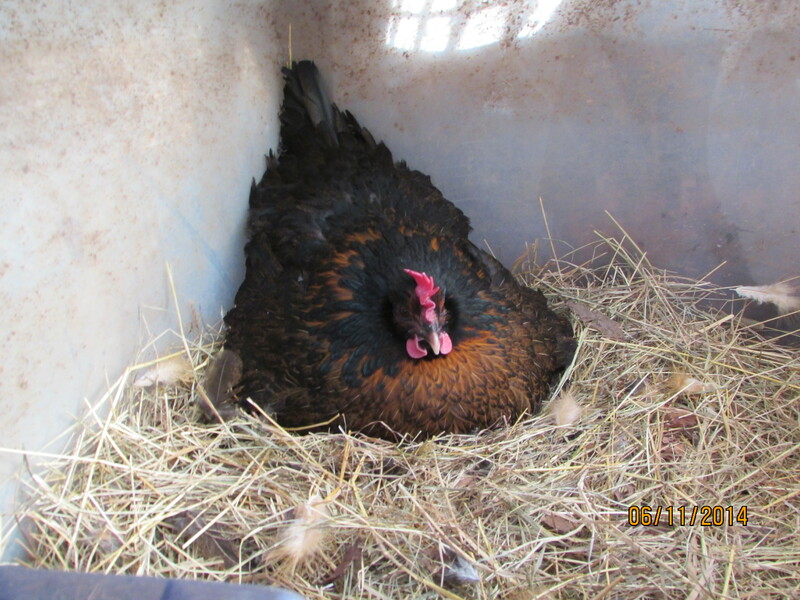 To encourage a hen to become broody, give her a nest of eggs to sit on. This can be annoying if it’s not intentional and you have just not collected them for a few days, as a broody hen will stop laying and refuse to budge from the nest except to eat and swim (if she is a duck. Chickens are not keen swimmers.) If you have bought eggs, put them right next to the hen. She will see them, assume they are hers and push them into the nest. A broody hen will adopt pretty much anything. 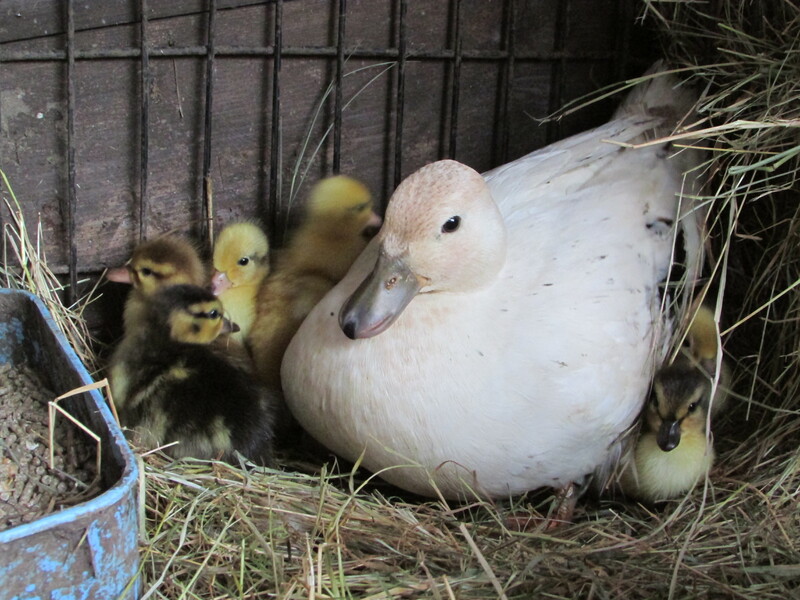 Not sure about other species, but certainly ducks will hatch chickens and vice versa. The temperature and timing depends on the bird to be hatched. A chicken takes 3 weeks to grow and a duck takes 4 weeks. At first a chicken egg needs to be kept at 37℃ for 19 days and a duck egg for 25 days. It also needs to be kept humid. In an incubator you can add water. A duck will go for regular swims. Presumably chickens sweat a lot. A chicken egg needs to be kept at 45% humidity for the 19 days. 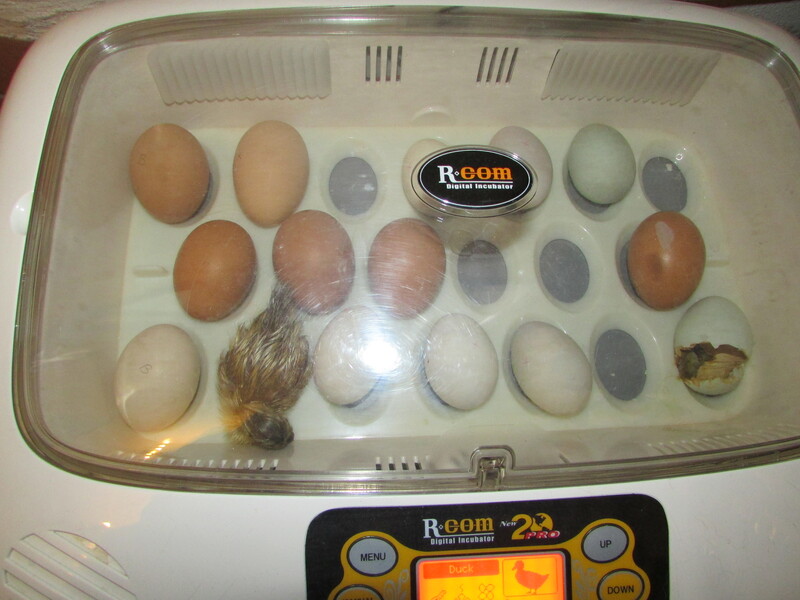 The eggs also need to be turned, roughly every hour. This stops them sticking to the side of the egg and being deformed. Most incubators do this for you. I have no idea how how a hen knows all this, pretty amazing really. As the embryo develops, it ‘eats’ the egg yolk, which it is attached to by an umbilical cord. Yes, ducklings and chicks do have tummy buttons! The yolk does not (as many people think) turn into the chick, it is just food. 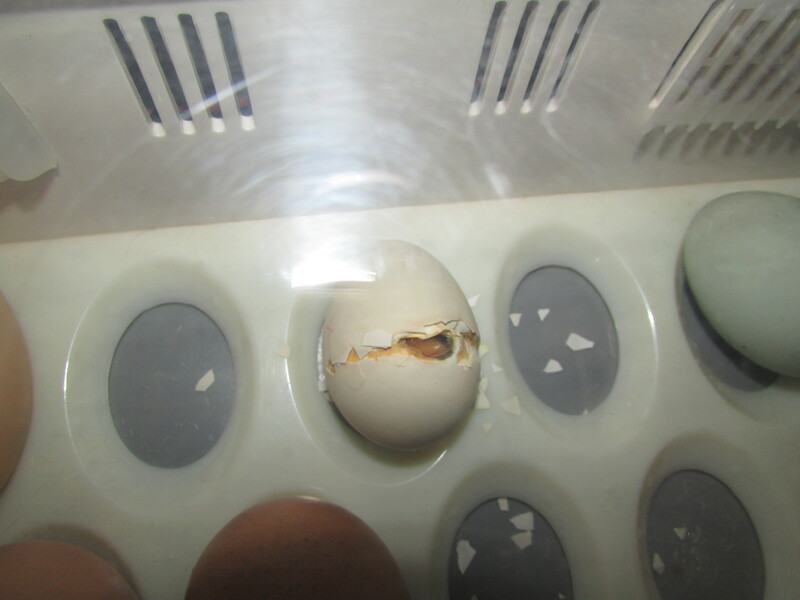 You can check on how the egg is developing after a week. If you shine a very bright torch onto the shell, you should be able to see lots of tiny blood vessels spreading out from a black dot. In the olden days they used candles but when I tried that I burnt my fingers and dropped the egg. I felt like a murderer. Any eggs that have not developed are probably not fertile and should be thrown away or they might go bad and the fumes will kill the other eggs. I check the eggs every few days after the first week. The black dot gets bigger until it is the only thing you can see other than the air space. 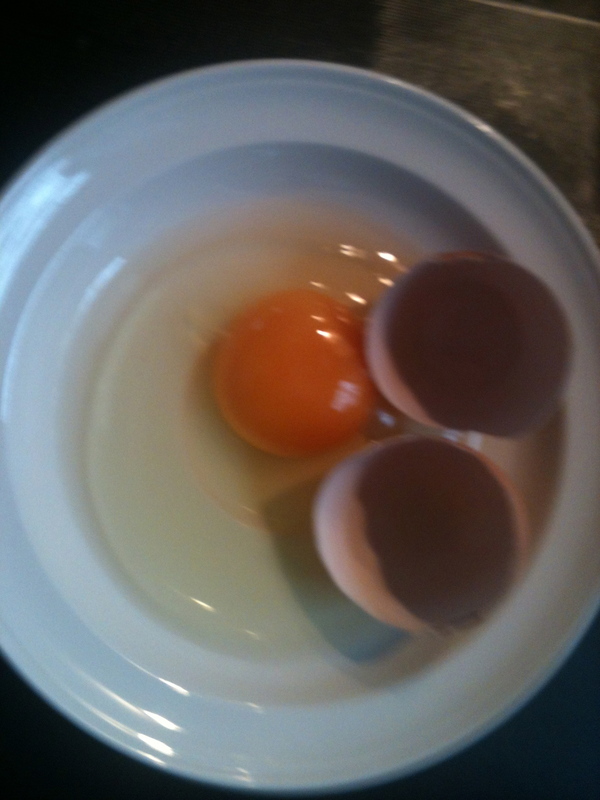 But, if the air space starts to get bigger or the gunge inside the egg looks like it has separated, throw the egg away. It means the chick has died. After 19 days, stop turning the eggs. They should hatch in 3 days. The temperature needs to be 37℃ and the humidity should be 60% . The eggs may begin to shake or even crack any time now. The bird inside is moving around, first into the air space inside the egg and then uses the little bump on its beak to begin to crack the egg. Sometimes you can hear them cheeping from inside the egg, which is very exciting! 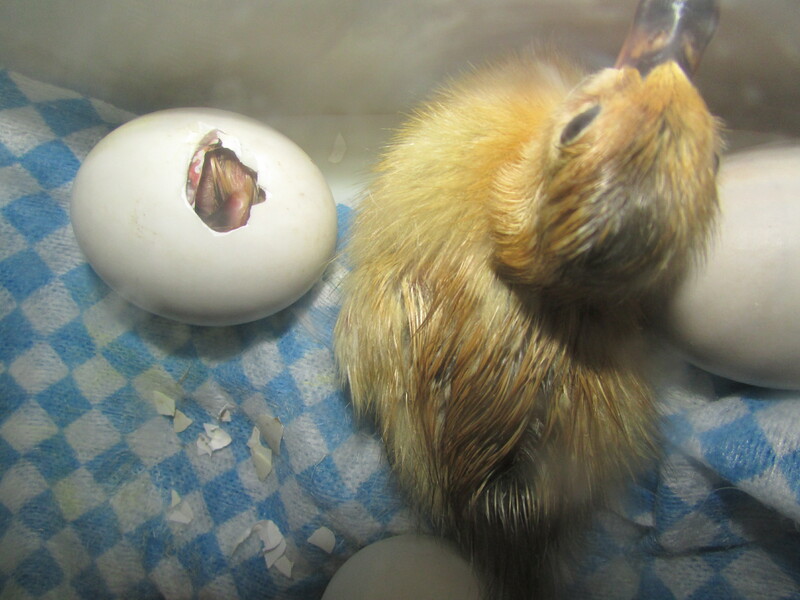 I have found that ducklings often begin to hatch fairly soon after after you stop turning the eggs and chicks do not really start until the end of the three days. If you are a sensible person, you will do nothing during this period. 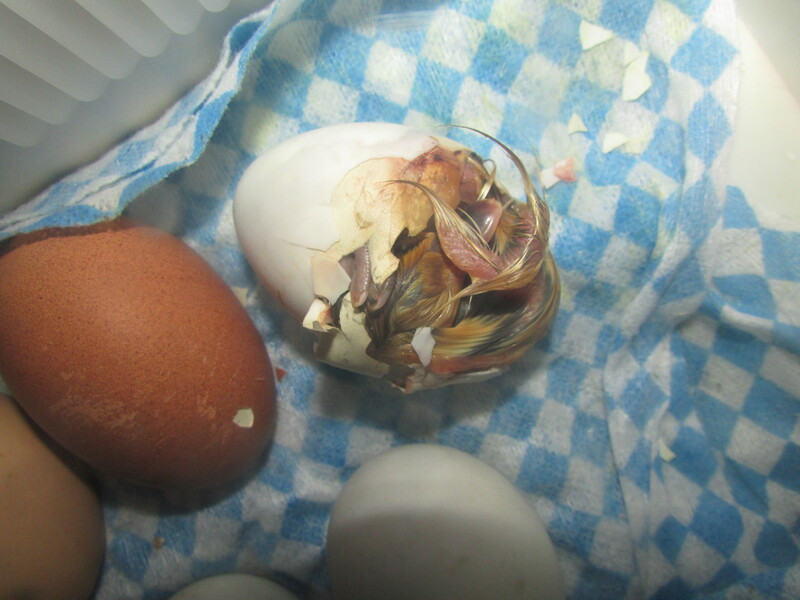 You will not remove the lid of the incubator or help a hatchling that has got stuck. Any bird that is too weak to hatch is probably not very strong and is likely to die within a few days of hatching. However, if like me, you are not particularly sensible and are more ‘mummy’ than ‘farmer’, then it is possible to help. 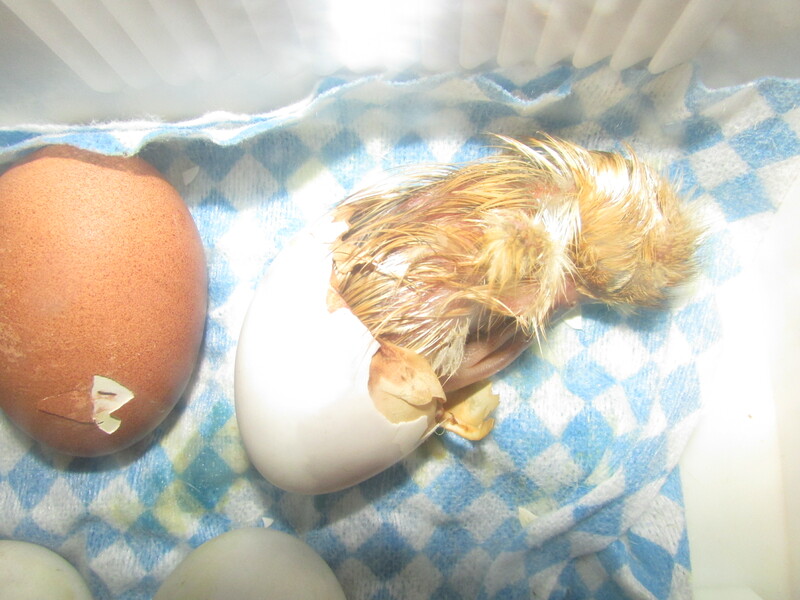 The two things to remember are that the hatchling needs air and that it must absorb the remaining yolk. Sometimes a chick is too weak to crack the shell. If, after two days of watching an egg shake and hearing it cheep, it still has not made a hole, I tend to help it (with a skewer or sweetcorn fork!) Make a tiny hole in the air space of the egg (use a torch to check the chick is not in that bit.) 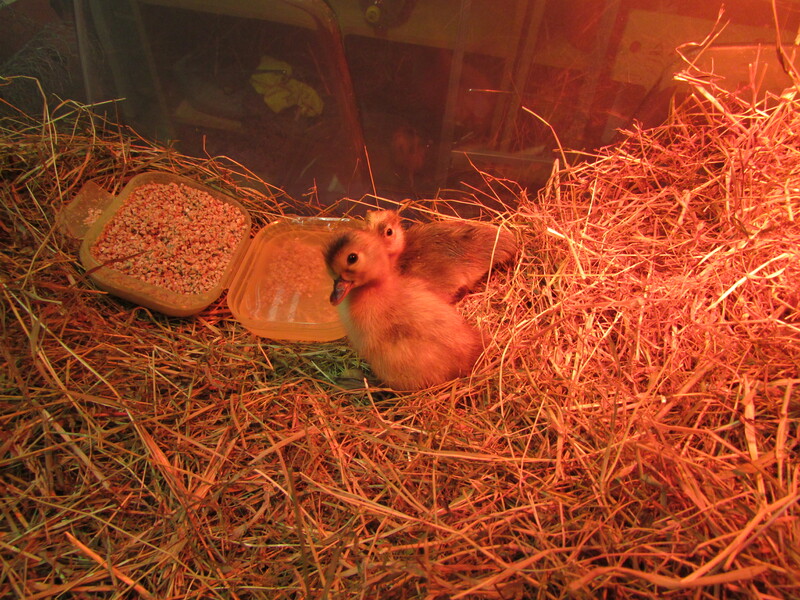 I then, very slowly remove pieces of shell, about 3㎟ every five minutes, letting the chick rest in between. Do not ever remove the chick completely, just the shell around the head which will be folded over but will straighten as you remove shell. The yolk needs to stay moist, so when the chick’s head is free, I sometimes add warm water to the remaining half of shell (nowhere near the head or it might drown) so the yolk does not dry out. Then I leave it. Sometimes a chick will sit in a half hatched state for over a day. If it is warm, has air and the yolk remains moist, it will be fine. Once it has got enough strength (from absorbing the yolk) it will hatch the rest of the way itself. Obviously this is rather time consuming, so do not begin to ‘help’ (or interfere as my children put it) unless you have alot of time and do not mind a bit of gore (there are a lot of capillaries around the shell and yolk, so expect a bit of blood. It does not seem to come from the bird, which is usually fine, but it looks a bit unpleasant.) When the bird has fully hatched, leave it in the incubator for about 12 hours. It will rest (and look like it has died) for a few hours, then will dry out and start bouncing around. When it is fully mobile, move it to the next stage. 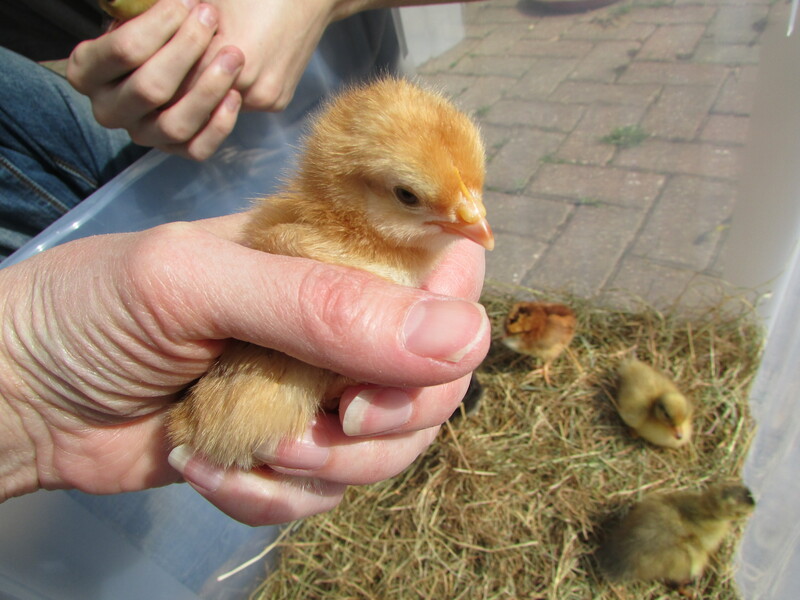 This will either be a brooder – a box with a heat lamp, or a mother hen. I have read that it is difficult to introduce new hens to an established flock (because they fight, unlike ducks, who will welcome anyone.) It is therefore much better to give the new hatchlings to your broody hen to raise. I simply carry them outside and put them next to her nesting box. She will look extremely surprised for a few minutes, then when no one else claims the chick, she will push it underneath her and you can relax! 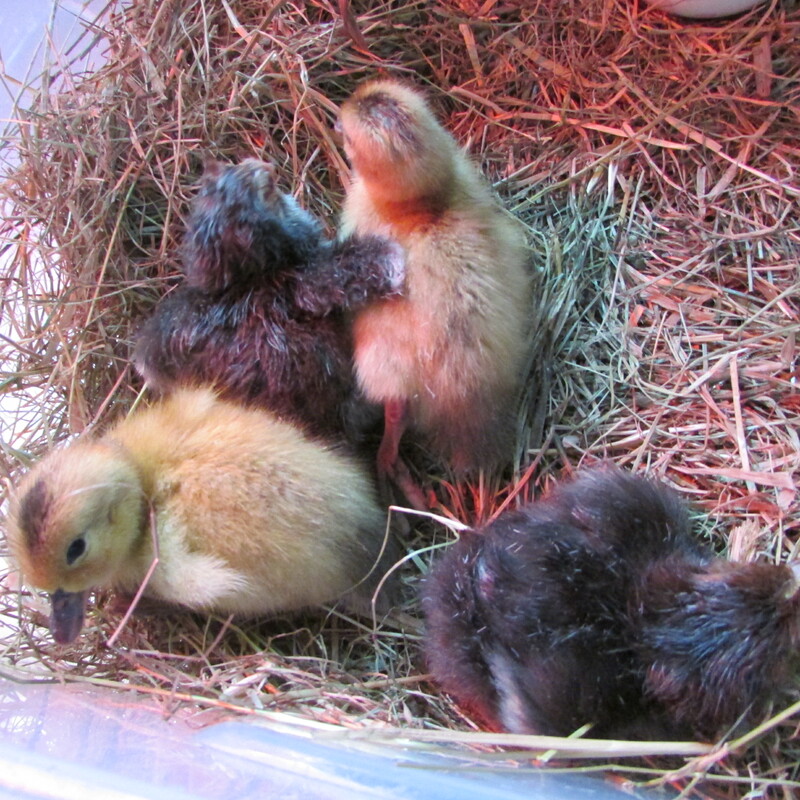 If I am raising the chicks or ducklings, I put them into a large plastic crate lined with hay. They need a heat lamp, water and food. I experiment with the height of the heat lamp – if they are huddled directly underneath it is too high, if they are in a far corner, it is too low. The water needs to be in a very shallow container so they can not drown (they are cute but stupid.) I feed them chick crumb. Some people give chicks medicated chick crumb because chicks are prone to infections (It’s not unusual for an apparently healthy chick to suddenly die.) However, I think it is better not to introduce antibiotics unless an animal is actually ill and I would prefer to risk the odd bird by giving them a more natural chick crumb. 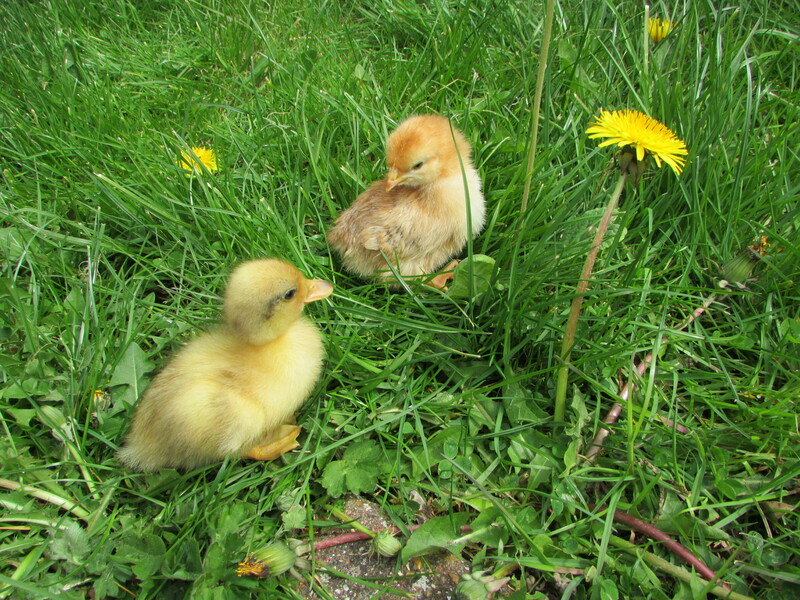 You cannot feed medicated chick crumb to ducklings or they will die. In an emergency, if you have no chick crumb, you can feed egg yolk to the hatchling. I keep the hatchlings very clean. I throw away the hay as soon as it is dirty or damp and keep their food and water fresh. However, outside raised chicks are constantly muddy, the mother hen will put grubs and corn on the ground for them to eat and will kick dirt into all the food. They seem to survive. A duckling can swim the same day that it hatches. It is kept waterproof by the oils that transfer from the mother when they sit under her. 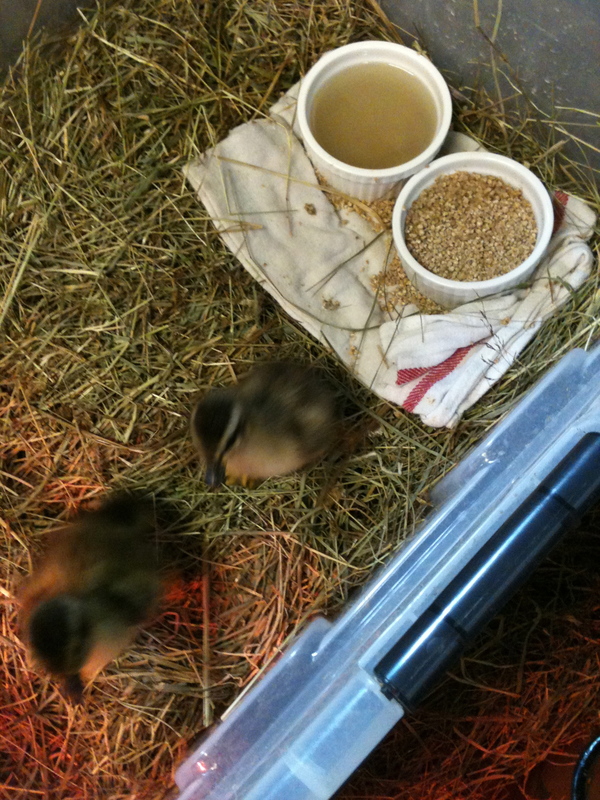 If they are raised in a brooder, they can still swim but after a few minutes will become water logged and should be returned to the lamp to dry out. They love water and try to splash in any water that they see, so it can be hard to keep their drinking water clean unless you buy a special drinking dispenser. Chicks do not like water! If you hatch ducklings and chicks together, the chicks will follow the ducklings to the water bowl and then look very cross when they get splashed. However, within a week, chicks have grown wing feathers and are beginning to flutter out of the box (so it needs a lid or to be in a dog cage.) You should then add a perch to the container and encourage them to roost at night (by removing the hay so the ground is not so comfortable.) 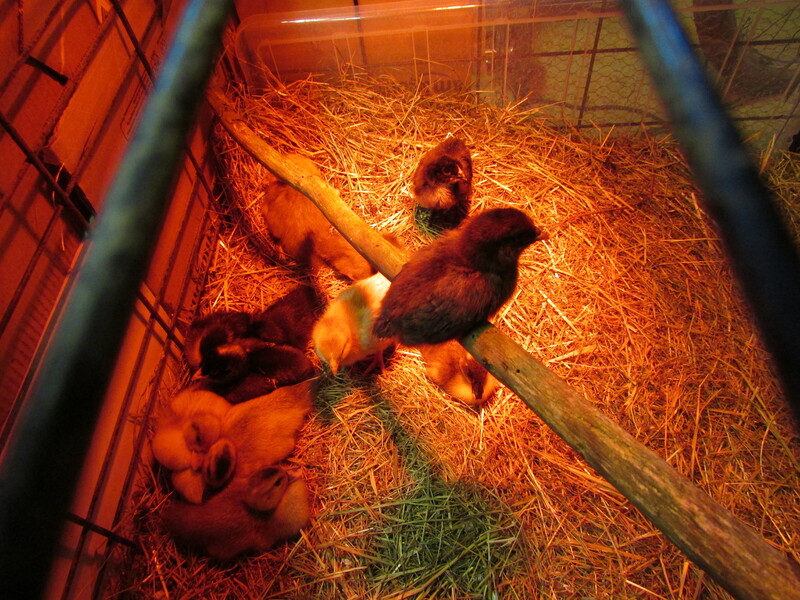 When they are a few weeks old they will always roost on a perch. As most of their poop arrives when they are asleep, it makes keeping the cage clean much easier and if they are free range they are safer if they sleep on a perch. 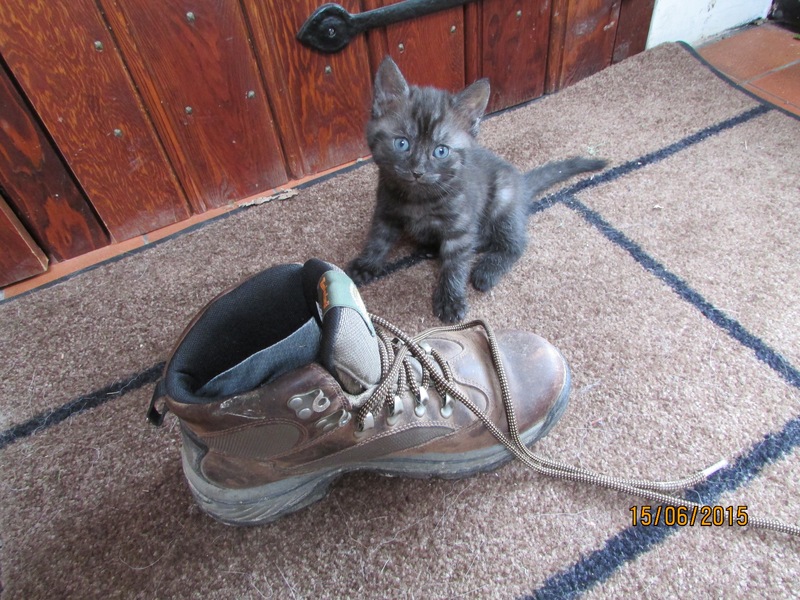 From this to this in 4 weeks – enough evidence for me that there is a God! 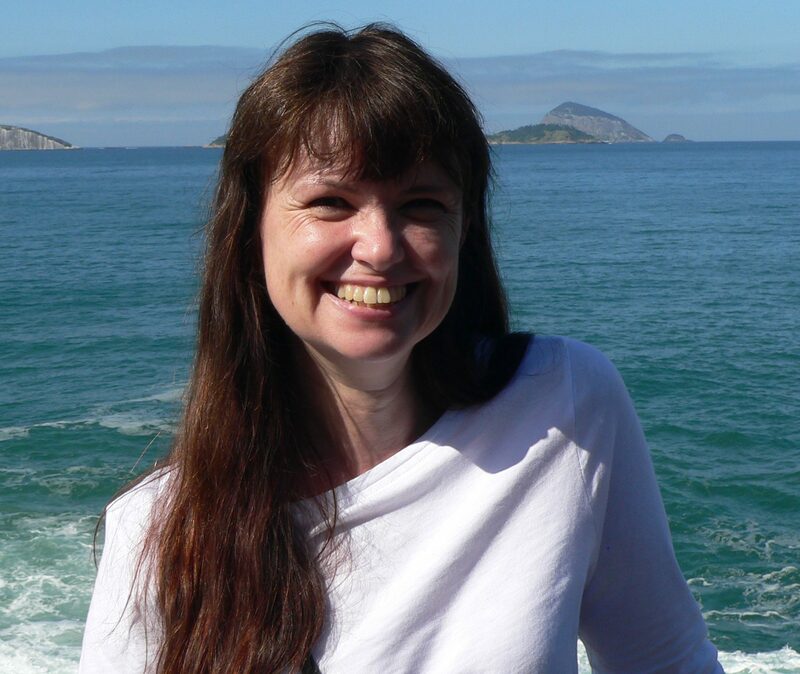 Fascinating (and funny, in places) ; very informative. 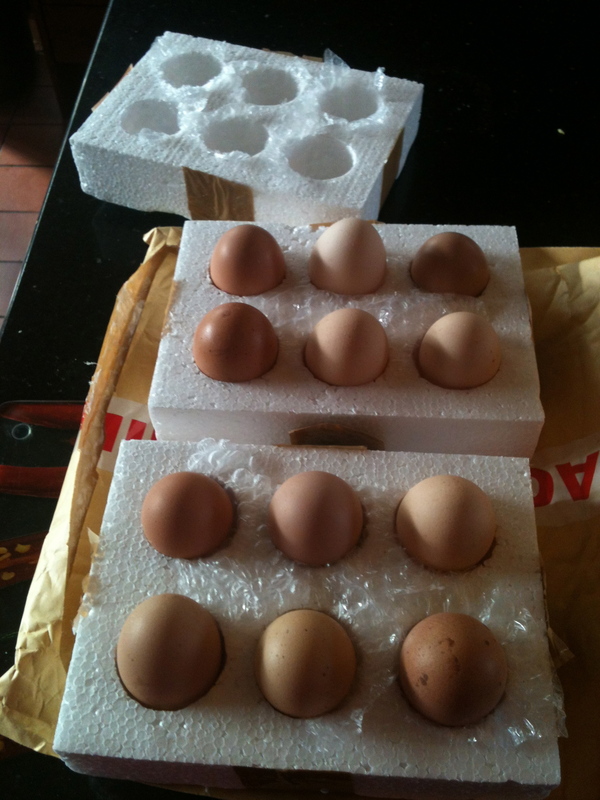 Made me want to get some eggs…..